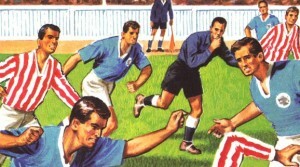 Ladybird Books 'The Story of Football'. This fascinating display of original artwork from the Ladybird footballing classic The Story of Football, first published in 1964, takes you on an illustrated journey through the history of the beautiful game; so, whether it's reliving being a child of the 60's or just seeing how children's books have changed, this unique display is a must see for all generations. Don't miss the chance to recreate scenes from the book by dressing up in kit from our 'Story of Football' inspired kit bag box!